Dennis and Judy Jones are not new to yachting. The American couple first chartered yachts 20 years ago, and since 2000 they’ve owned three yachts – each named D’Natalin and numbered in order. So, in 2012, when they were ready for D’Natalin IV, they knew what would make them happy, yet couldn’t find an existing yacht that met their criteria. An experienced broker made a compelling case for something not yet considered: the best way to get everything they wanted was to build. Although the family had chartered and owned yachts from European shipyards, when considering a construction project that would be a family legacy, Dennis Jones – once and always a US Marine – conveyed his patriotism by insisting they give priority to a US yard. They tasked the family’s broker, Christian Bakewell of Merle Woods & Associates, with finding an American yard that could build a yacht meeting all their criteria and deliver in a limited time frame. It seemed impossible, but Christian Bakewell says: “Our office had the inside track on a hull under construction at Christensen, so the choice became easier when we were able to get Christensen to commit to a very aggressive one-and-a-half-year delivery.” The laid hull was part of Christensen’s 49 metre 160 Custom Series. These builds begin with a set engineering package and a fixed price, but layout, décor and exterior styling are all open for customisation. The Joneses were still wary of a new build project, even with such lofty promises as expeditious delivery and fixed pricing. 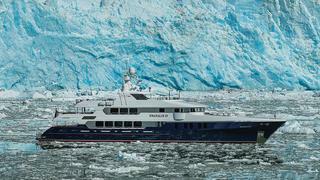 But they didn't need to be wary: D'Natalin IV was launched in April 2014. “A lot of our early meetings centred on getting the Joneses comfortable with the idea,” says Christian Bakewell. “They had heard horror stories of poorly negotiated and managed new builds that ran way over budget, so were cautious.” That Christian Bakewell’s previous two builds had finished under budget and on schedule went a long way toward making the Joneses at ease. But it was not just logistics that drew the family to Christensen. They liked the traditional lines of Christensen yachts, and many of the Jones’s must-have features were already incorporated into the basic design. With an ambitious itinerary for delivery, Christian Bakewell flew to New York City to get the D’NatalinIV project started. “Working out the details of the general arrangement was a fun exercise for us,” says Christian Bakewell. “We sat on the back of their yacht and marked up full-size prints of the plans; I would take a picture of these plans and email it to Christensen. 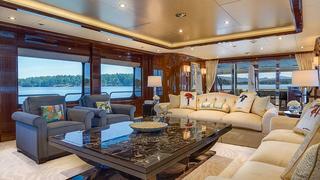 For D’Natalin IV's interior, the Joneses worked with yacht designer Carol Williamson of Carol Williamson + Associates. “This was our first time working together, and it was an amazing experience,” Carol Williamson says. “[The owners] requested a transitional interior with a strong traditional influence.” The result is an interior her captain Gregory Clark describes as “a comfortable, gentleman’s yacht”. Though the owners hail from the Midwest, the colour palette for D’Natalin IV is reminiscent of the yacht’s Pacific Northwest origins. The deep nautical blues, and smoky, mafic interior tones with creamy accents look perfectly at home when I meet up with D’Natalin IV during one of her maiden voyages in Juneau, Alaska. Secured at a face-dock on the Gastineau Channel, with the snow-capped Mt Roberts looming as a backdrop, D’Natalin IV, with her traditional US lines, red bootstripe, white superstructure and navy blue hull, is nothing less than an American beauty. 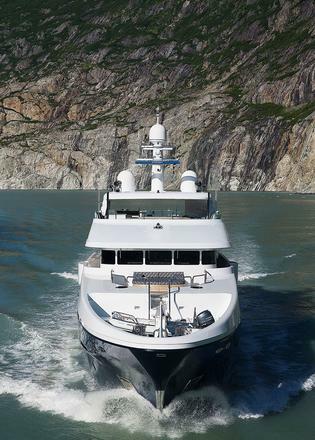 Although they are well versed in the pedantic nomenclature for a yacht’s strata (main deck, lower deck...), the Joneses have their own names for D’Natalin IV’s decks. One boards her at the “show deck”, for example. 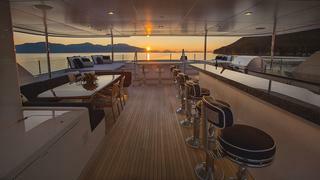 A massive aft deck that can be completely enclosed with acrylic glass panels opens to an elegant main saloon and formal dining area. 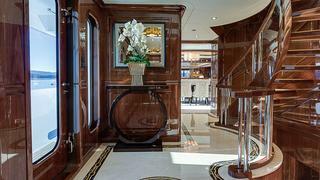 Amidships are an elegant foyer, a nicely sized dayhead and an enclosed galley, which was designed in part by their son-in-law, who is the chef of the family. Forward of that is an exquisite full-beam master with an owner’s office and full-beam master bathroom with heated floors. As a family yacht, the Joneses prefer to use the upper decks of D’Natalin IV; their favourite hobbies influenced the layout of these spaces. The upper saloon and boat deck – known as the “friends and family deck” – is Judy’s favourite level. The upper saloon is appointed with a seating area, wet bar and a generous gaming table for games of cards, while a sizeable covered deck has space for another favourite pastime, stitching. In fact, while D’Natalin IV was being built, Judy Jones hosted friends and family for stitching parties where the ladies worked on designs for accent pillows. 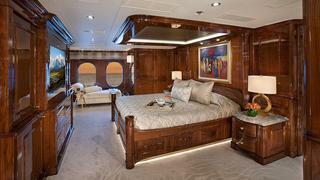 Finished projects were ultimately incorporated into D’Natalin IV’s décor. The sun deck is known as the “party deck”, and is Dennis Jones’s favourite. “It is just a perfect place to take in the view and relax,” he says. A large wet bar and ample seating are situated aft of an equally massive spa pool. “This is one of the spaces where we really put Christian and Christensen to task,” says Dennis. 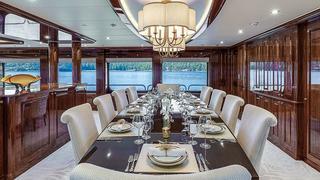 “We wanted control of airflow on this boat, so we did not have drinks and plates blowing over under way or in the wind. The removable glass panels look great and have been an effective solution.” And when one is finished on the party deck, just go below to the “recovery deck”. The lower deck has five additional cabins: two twins, two king cabins and a third VIP, which is essentially a second master in terms of size and finish. Throughout D’Natalin IV, the owners’ whimsical traditionalism is evident. Colourful art by LeRoy Neiman are a nod to their Midwestern roots. Other works of art are souvenirs of their travels, each with a story to tell. The ship’s dog, Manfred, is a colorful metal sculpture that sits at the entrance to the main saloon reminding all who enter not to take themselves too seriously once they step aboard. 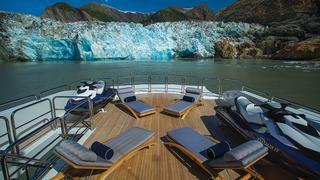 D’Natalin IV is a collaboration of passion, professionalism, workmanship and ingenuity. Though designed to take her owners around the world, her essence is that of a timeless American beauty, and she is heartwarmingly symbolic of one family’s attainment of and belief in the American dream.